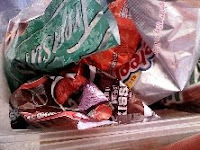 Picture of: bags of candy going into the Christmas Party gifts for Saturday's family party. Today I: pretty much stayed off grid again today; ordered pizza and drinks and took a mini Christmas party to a relative who has been too ill to join the other parties; baked goods for Saturday's party. Peace.